Millets, suddenly, are a focus area for the Union Ministry of Agriculture. Waking up to the nutritional benefits of these long-neglected cereals, Krishi Bhavan, the Delhi headquarters of the ministry, has in the past year been doing its best to help the small, marginal and tribal farmers who cultivate these hardy crops. But here lies the rub: its best is turning out to be a double-edged sword. By promoting the standard formula of modern farming techniques, traditional millet cultivation is being undermined and could jeopardise the future of its farmers, according to the millet lobby. The ministry’s Initiative for Nutritional Security through Intensive Millets Promotion or INSIMP is a seemingly well-meaning scheme. With a `300-crore outlay in 2011-12, it covered 772,857 hectares (ha) (against a target of 671,300 ha) in 16 states and is demonstrating improved production and post-harvest techniques along with ways of adding value to the crops. Underpinning the programme is a cluster approach to ensure that the benefits of extension services reach the farmers in an integrated manner. So, compact areas have been chosen to maximise benefits: 1,000 ha per unit for sorghum (jowar) and pearl millet (bajra), 500 ha for finger millet (ragi) and 200 ha for small millets. The last consists of an assortment that comprises five other millets, from foxtail to barnyard, little, proso and kodo (see box). These are highly variable and hardy, small-seeded cereal crops that have been traditionally used as foodgrain by farmers in the semi-arid regions of India where rainfall is minimal. According to official figures, they account for 47 percent of the total coarse cereals grown in the country—this includes maize and barley— but just eight per cent of the total cereal production (rice and wheat). INSIMP is a response to a nationwide campaign to bring millets back into the diet and in the public distribution system (PDS) by a federation of farmers, nutritionists and food activists known as the Millet Network of India (MINI). The network is campaigning to end the steep slide in the area under millets which has declined from 38.83 million ha in 1949-50 to about 18 million ha in 2010-11. INSIMP was formulated at a brainstorming session held in November 2010 and the project was kicked off in kharif 2011 under the Rashtriya Krishi Vikas Yojana (RKVY) which funds state projects. 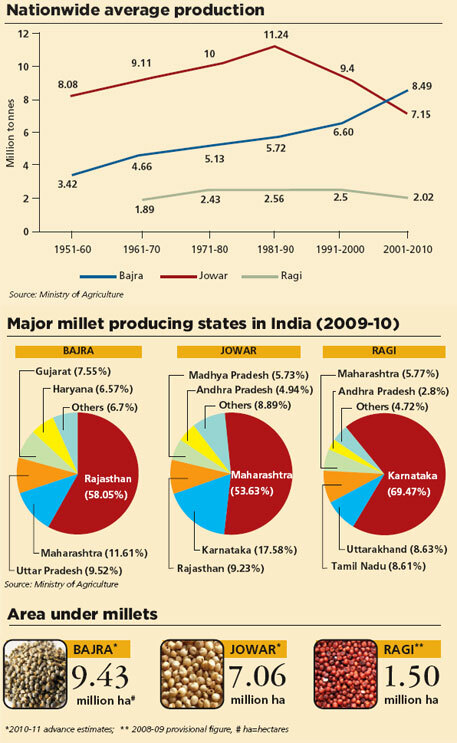 And states appear to have taken enthusiastically to the millet initiative. As a result, an additional Rs 175 crore has been allocated for the current year to cover an additional area of 723,000 ha. Clearly, Krishi Bhavan is not stinting funds for the millets programme. But controversy is also brewing. While INSIMP has some commendable features, it is also being viewed as a threat to the traditional cultivation of millets which has so far been free of chemicals—and dependence on the market for external inputs. But with farmers being weaned on chemical fertilisers and pesticides whose prices are galloping, there is justified concern that the millet initiative might led to indebtedness among the small and marginal farmers. The reason is the kit mentality of agriculture mandarins. Kits have become the hallmark of Krishi Bhavan schemes to increase production and productivity of all crops from maize to rice. Under INSIMP, states supply beneficiary farmers with free kits that include fertilisers, bio-fertilisers, micro-nutrients, seed treatment and plant protection chemicals worth up to Rs 3,000 per ha. In addition, there is an incentive of Rs 3,000 per quintal for hybrid seed production of pearl millet and Rs 1,000 per quintal (1 quintal=100 kg) for high-yielding varieties of other millets. The bulk (75 per cent) of this incentive goes to the farmer. All these are reasons for disquiet, says MINI convener P V Satheesh, who heads Deccan Development Society, a non-profit that works with several thousand millet farmers in Andhra Pradesh’s Medak district. 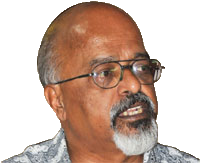 Satheesh warns the “only safe, inexpensive and farmer-controlled system will turn into an expensive and externally controlled system” (see ‘INSIMP will deepen agrarian crisis’,). But a spokesperson of the ministry told Down To Earth that “the contents of the kits are only illustrative. States in consultation with their agriculture universities or Indian Council of Agricultural Research (ICAR) institute are free to modify the contents of the kits as per local situation.” Andhra Pradesh and Rajasthan are doing so and Odisha, too, is following suit. Rajasthan agriculture officer (plant protection) Mukesh Sharma says the state does not include weedicides as there is no problem of weeds in sorghum and pearl millet, and pesticides are being distributed on need basis. However, the continuing spike in fertiliser prices has made the kits extremely expensive, and Sharma says “it’s going to be tough to keep to the budget now”. This may have prompted Odisha to allow non-profit Living Farms to undertake INSIMP without the chemical component in the three districts of Koraput, Malkangiri and Rayagada. It is following the example of Deccan Development Society which is working in tandem with the Andhra Pradesh agriculture department to prove that millet farming can be done without any chemical inputs. Some scientists endorse this approach. M V Channabyre Gowda, project coordinator (small millets), ICAR, says, “The use of pesticides and weedicides in small millets is negligible as these crops attract less pest and disease load. However, cultural (traditional) methods of weed control are practiced extensively. In fact, some of the high-yielding varieties are resistant to important diseases and hence use of chemicals for disease control is not warranted.” The main reason is that the less intensive agriculture practised by poor farmers in rainfed, tribal and hill areas makes the use of chemicals non-remunerative. Similarly, C Tara Satyavathi, principal scientist, Indian Agriculture Research Institute (IARI), who specialises in pearl millet breeding, points out that insect pests are relatively less of a problem in most of the pearl millet growing areas in India because the cultural (traditional) control measures have been worked well to minimise the insect damage. “In some of our research experiments we spray pre-emergence herbicides to save labour and protect the crop from weeds and competition in early growth stages. Otherwise, there is no usage of herbicides or pesticides in general.” In which case, do farmers need pesticides and weedicides for growing pearl millet? Satyavathi’s answer is unequivocal. “They don’t need any pesticides at present. Weedicides also may not be required,” she declares. But with the government setting out higher production and yields as the goal, the scientists’ views may well converge on the need for synthetic fertilisers and chemical pesticides. While INSIMP is bringing much-needed acreage under millets, it could also be setting the stage for a new farm crisis. Are pesticides and weedicides normally used in the cultivation of millets? To my knowledge, no traditional millet farmer uses any of these. No millet crop attracts pests. Since most of the traditional millets are grown ecologically, they do not produce weeds. Actually, the definition of weed is “a right plant at a wrong place” since every single plant in nature is useful, either as food for humans or cattle, and/or as medicine for both. Therefore, they are called uncultivated food plants. It was the introduction of chemicals that created weeds. In our area of Pastapur, about 15 years ago, we surveyed the number of uncultivated foods and found out there were over 160 such “weeds” that were helping people in their nutrition. Thus, the question of use of weedicides does not arise. Since most traditional millet farmers are also biodiverse farmers, they grow pulses and oilseeds. Some of these pulses attract pests, in which case creative and inexpensive control methods are used. You must be aware that the government is promoting the use of both pesticides and weedicides? Yes, I am acutely aware. Actually, we have fought with the state on this package and argued that if instead of these seed and chemical kits, it could make a cash payment to farmers directly, they could grow millets ecologically and more profitably. A well meaning Agricultural Commissioner who was in charge told me that the idea of INSIMP was “an effort to introduce chemicals to millet farmers since they were not using it”. How will this change the economics and safety of millet production in the country? It will make the only safe and inexpensive cropping system that is farmer-controlled into expensive and externally-controlled system and make farmers dependent on market. It will deepen the current agrarian crisis. How are you tackling this issue? 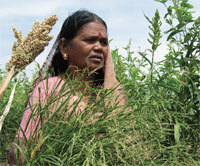 Thousands of women in DDS are ecological millet farmers. They have set up a model of how to control their own food and seed systems. To a small extent we tried to influence INSIMP with this model. The Agricultural Commissioner accepted our argument and let us use INSIMP without the kits. As a result, on about 1,012 hectares (ha) in Medak, farmers grew millets in their own traditional biodiverse system and achieved yield levels of up to 1,500 kg/ha, which was the highest for the state. This year, we may get to work on 2,023 ha under INSIMP. If this comes through, then this is the way forward. As convener of MINI, have you written to Krishi Bhavan about the adverse impact of INSIMP? I have not. A mistake surely. But I wanted us to have a good pilot under INSIMP and make a field-based argument which I thought would hit home more powerfully. How do you use INSIMP without the kits? Do you get the cash equivalent? Yes. The cash equivalent of an INSIMP kit is about Rs 5,000 per ha. This is the amount they have given DDS farmers for every hectare of jowar they have grown. In all, they gave Rs 19 lakh to about 1,400 farmers who grew jowar as a part of their biodiverse farming system. The money was proportionate to the area of jowar they have sown. We have won a small battle, but there is a big war to be fought. We are demanding the government to abandon its single-crop approach, such as a jowar block or bajra block or foxtail millet block and treat a millet field as it should be: a variety of millets anchoring pulses and oilseeds, in all their biodiversity. Until this comes through we will continue our struggle. Most importantly, farmers have been allowed to plant their own landraces and do not insist on hybrids. Most of the weeds that grow in millet farm are edible and a rich source of Vitamins and minerals. please visit: http://www.fao.org/docrep/012/i0370e/i0370e00.htm for a detailed research report. Millet, pulses, oilseed and uncultivated greens together make balanced diet that's why millets are always a mixed crop. Kudos. India needs more PV Sateeshes to ensure the economic safety and ecological diversity of our farmlands. I would like to commend the authors and the Deccan Development Society (DDS) for this timely story on millets. Millets play a distinct role in over 2/3rd cultivated area in the country that has three primary naturally endowed strengths, namely dry land, preponderance of marginal and small farm owners and repository of knowledge and technology domain most appropriate for the two earlier mentioned strengths. DDS in their own initiative of engagement with INSIMP protocol and challenging the unscientific wisdom of the so called agricultural scientists-subject matter specialists, for instance in Zaheerabad village in AP state, managed to get state assistance of about Rs. 1929/- per hectare for millet cultivation. The contrast with the per hectare budgetary outlay of Rs.2237/- and the additional per hectare outlay of Rs.4131/- is very disturbing since it militates against the common but differentiated responsibilities-CDR, the equity discourse to be implemented by the public agencies. For example Zaheerabad village experiences of DDS suggest that the villagers were more than match with a mere 47% of the per hectare additional allocation (Rs.4131/-). The flawed kit and incentive mentality also finds its reflections in heightened obsessions with the hybrid seed and chemicals applications. It appears that ICAR in particular and the agricultural scientists in general (like the sunflower) have completely discounted our beloved PMs exhortations made at the 83rd ICAR Foundation Day speech:Ã”Ã‡Ã˜ You must never lose sight of the fact that your main client is the Indian farmer. Unless you engage with farmers and their problems, you will not succeed in transforming new knowledge into higher productivity and better incomes for our farmers.Ã”Ã‡Ã˜ Surely, PM proposes and ICAR disposes that enhances crisis and in fact sustains it at a faster pace. The 12th Plan theme song thus goes for a six. What is the course of actions to be considered? DDS has shown a viable pathway to a new agricultural fundamentalism that must be engaged with post-haste. The biodiversity of these rainfed areas needs immediate documentation and articulation in the RKVY documentation. For example, RKVY, needs to get the true ground based ATMA into the C-DAP. In this respect one wonders how is it that all district agriculture development plans mention a great lamentation about preponderance of marginal and small farmers and rain dependent farming system as the major weakness while it is the major strength. A great amount of unlearning should be the order of the day to shake off the hangover of the joint Indo-US knowledge agreement on agriculture. PM certainly appears to have revised his understanding about this agreement if his speech at ICARÃ”Ã‡Ã–s 83rd foundation day on 16th July 2011 is any indication.